Pet products and tips to help keep pets safe and entertained during the hot summer months. Make playtime [with pets] earlier in the morning, or later in the evening, just don't forget it altogether. Summer days mean more daylight to enjoy activities with your pets. 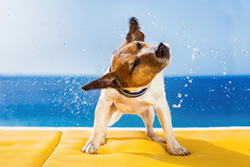 From playing in the backyard to taking day trips to the beach or even an overnight camping trip, the American Pet Products Association (APPA) encourages pet owners to head out and about with their four-legged friends this summer. Not only is increased bonding time beneficial to human health, but with more than 8.5 million obese or overweight dogs and 14.6 million overweight cats, (according to APPA’s 2015-2016 National Pet Owners Survey) active outings can be a great start to getting pets in shape as well. Here are some helpful tips and fun pet products to consider when enjoying the summer months with pets. Provide hours of fun with non-toxic IncrediBubbles by Pet Querks Inc. Both dogs and cats love chasing and popping these long-lasting bubbles and kids will want to play too! They dry in the air and land on the ground waiting to be popped. Offered in ‘catnip infused’ for cats, ‘peanut butter infused ’ for dogs and ‘peach infused’ for both dogs and cats. These bubbles will make any party poppin’. Frisbee is a perfect summer pastime, so enjoy some high-flying fun with the Bottle Top Flyer by SodaPup. This durable Frisbee in the shape of a bottle cap, is made from a rubber compound that is rigid enough for great flying characteristics, but soft enough to prevent harming a dog’s mouth. It’s non-toxic, FDA compliant and manufactured in the USA. Hit the trails with nutritious Pride Mix by Wholesome Pride, a quick and healthy snack that’s great for dogs on the go. Made of dried sweet potato dices sourced directly from U.S. farmers, dried blueberries and banana chips, this mix is a guilt-free treating option for owners. Epi-Pet Sun Protector Sunscreen is the only FDA compliant, safe and tested sunscreen for both dogs and horses. The non-greasy, quick dry formula is safe if licked after applied to the pet and provides up to 80 minutes of protection from the sun. Epi-pet Sun protector sunscreen is water and sweat resistant and can be sprayed at any angle including upside down. Great, for all breeds, but especially short-haired breeds like boxers, bulldogs and Pit Bulls. For more information, images or interview opportunities, please contact Jamie Baxter at 775-322-4022 or Jamie(at)theimpetusagency(dot)com. The American Pet Products Association (APPA) is the leading trade association serving the interests of the pet products industry since 1958. APPA membership includes more than 1,200 pet product manufacturers, their representatives, importers and livestock suppliers representing both large corporations and growing business enterprises. APPA's mission is to promote, develop and advance pet ownership and the pet product industry and to provide the services necessary to help its members prosper. APPA is also proud to grow and support the industry through the following initiatives: Pets Add Life (PAL), the Human Animal Bond Research Initiative (HABRI), The Pet Leadership Council (PLC), the Pet Industry Joint Advisory Council (PIJAC) and the Pet Care Trust. Visit http://www.americanpetproducts.org for more information.